my wonderful Eliana and I... Son of Douglas and Debra Johnston, and daughter of Christina Camacho and David Grinstein were married at Mount Hope Cemetery in Bangor, Maine at 10am on the 7th of July, 2007. I the above image is a scan of a print I worked on as a project for a class last semester, and also to use as our wedding invitations/announcements. 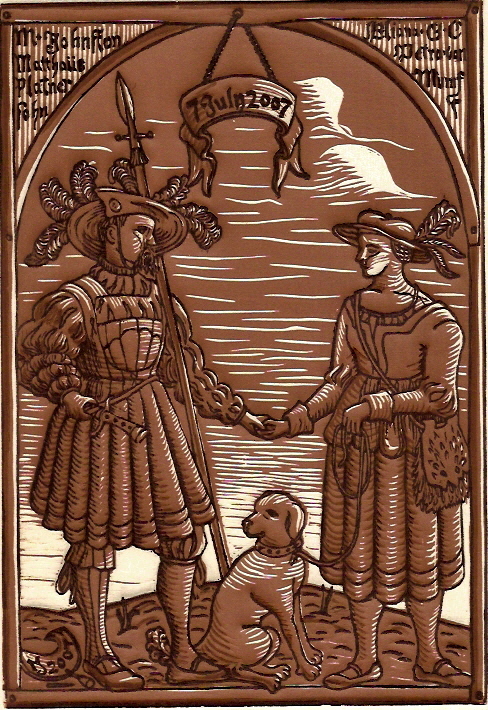 It was my attempt at a chiaroscuro woodcut from three printing blocks... this kind with of woodcut with multiple tones was sort of a fad with german printmakers and collectors for a few years right around the first decade of the 16th century. It is also based on the style of double portrait from the same time, which was often used for wedding portraiture.